The Crew Call for the latest ops session resulted in full two-man crews for all four local freights, as well as a "Superintendent of Operations - Shoreline Division," and yours truly acting as General Superintendent, Tower Operator, Agent, and Dispatcher. After all the crew members signed the Register, the next step was to have a job briefing and go over the latest Bulletin Order which contains any last-minute operational changes. 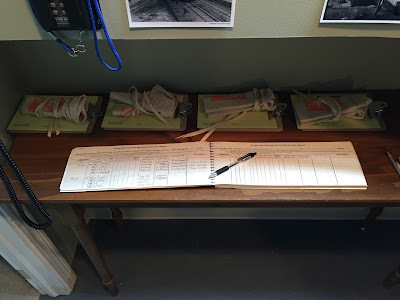 Once our briefing was over, it was time to hand out the paperwork for each train and fire up the Saybrook Tower control board and the fast clock. The panel controls all the turnouts in Old Saybrook and the fast clock is an app running on my iPad - at this point used only to indicate passage of time since there's no formal schedule for the 4 locals. But it's helpful for dialing in the interaction between all the trains - and it's neat to feel like time is really passing. 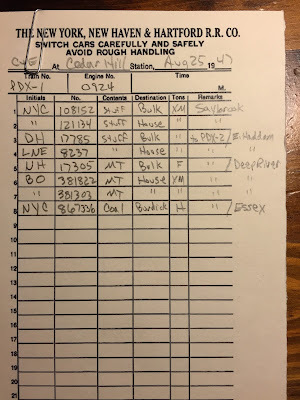 Once everyone had a chance to review their paperwork and ensure that their trains contained the cars they should have, we fired up the throttles and started the clock. 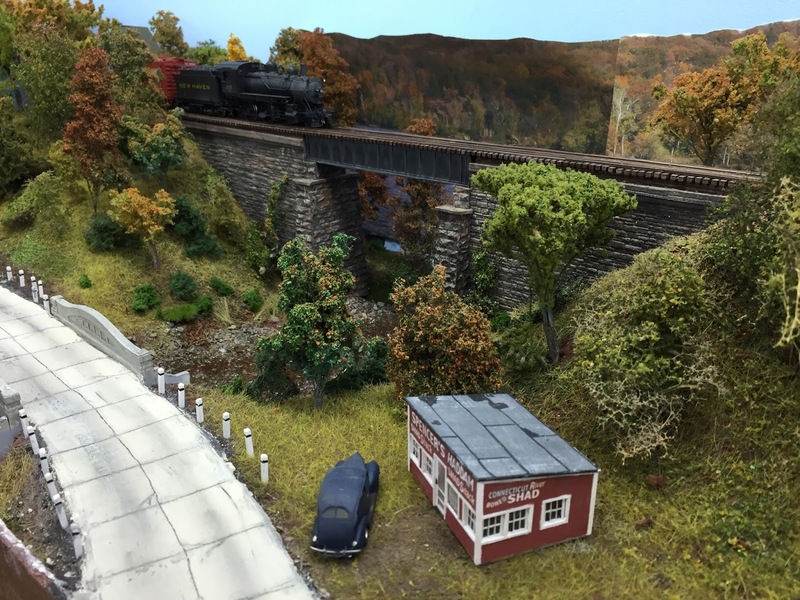 Pieter and BobV on PDX-2 - the Haddam Local. Randy looks on. As "Superintendent of Operations - Shoreline Division" he's responsible for dialing-in the interaction between PDX-1 and PDX-2 here in Old Saybrook. Pete's in the back, as conductor of PDX-1 with Roman as engineer (probably sitting on the stairs). The more we operate the more it's becoming apparent that Old Saybrook is a real hotbed of activity when the two locals are in town at the same time. We're not operating actual mainline trains as of yet, but the locals still need to get permission to foul the east and westbound mains so that makes things interesting. I think it took the two locals about 40 real minutes to sort out everything between themselves - which is actually about how long it took on the prototype. Unfortunately, the 4:1 fast clock made it "seem" like 2hrs & 20mins. 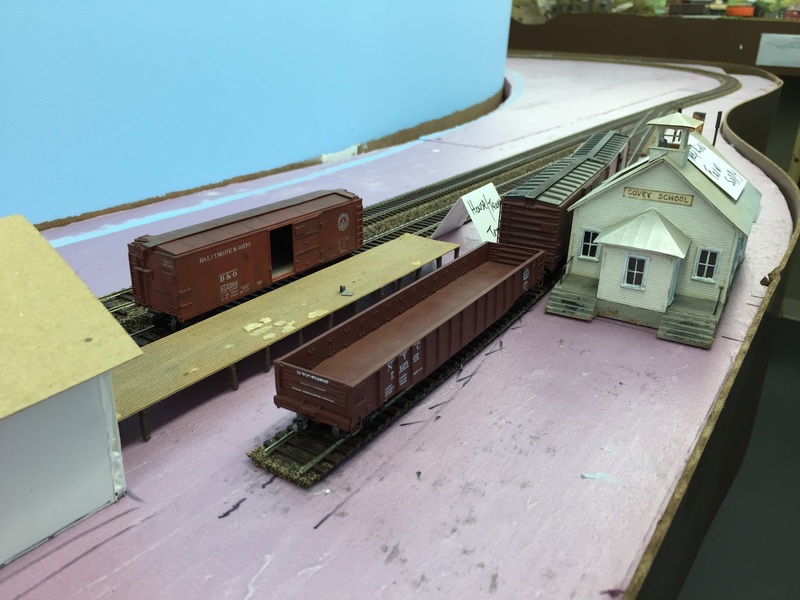 Just another example of how even 1:87 scale switching is done in 1:1 time. Job cards will be a big help here (more on those below). The gang's all here in Sayborok - Roman, Randy, Pete, Bob and Pieter are trying to sort things out. The Airline local had newly "upgraded" DERS-1b (Alco RS-1) #0669 as power this session. 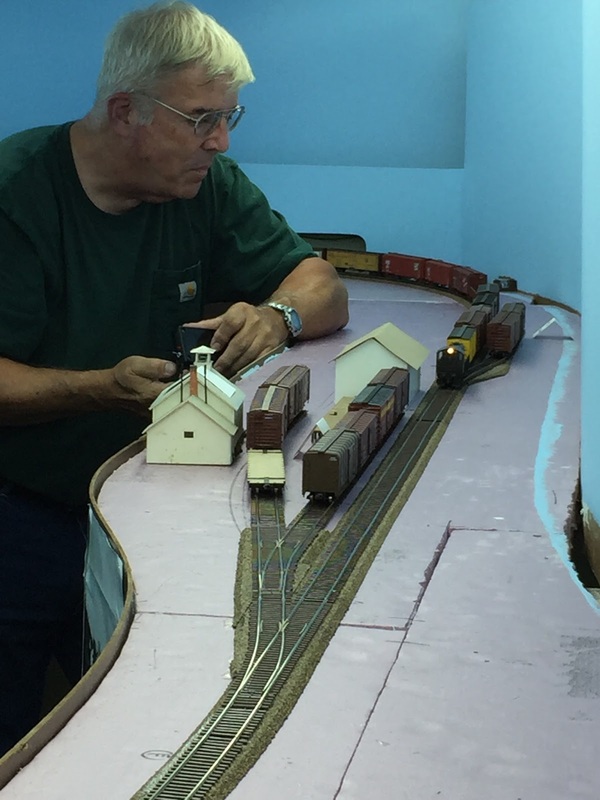 Bill downloaded the latest ESU "Full Throttle" functionality to this engine's stock decoder earlier in the week, so I our Motive Power Department decided he'd be the best one to try it out. 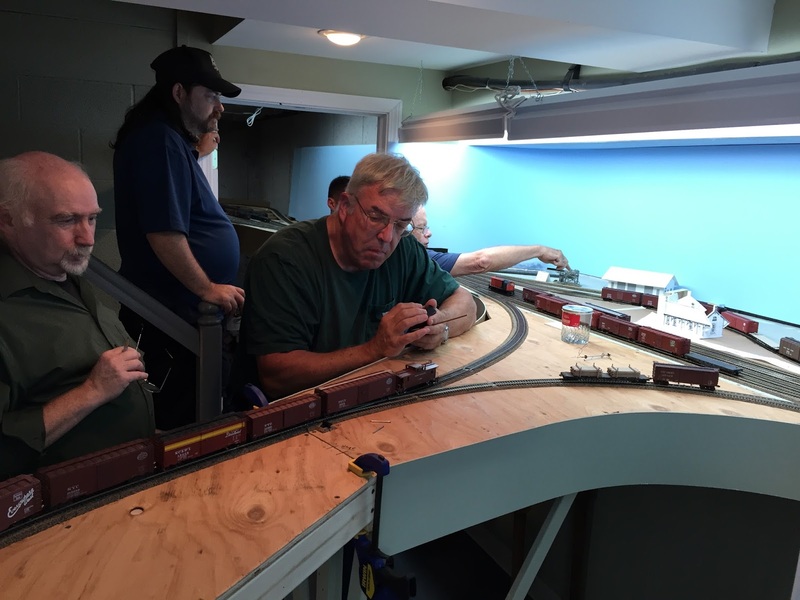 Bill and Greg operate HDX-12, the Airline Local, in Somerset. 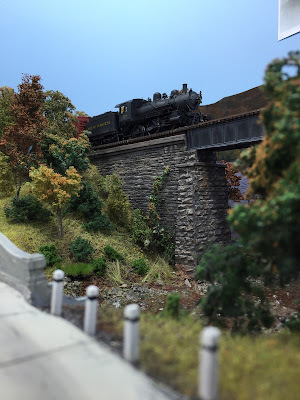 Unfortunately, the power used for the Valley Local (K-1b #287) is still having trouble keeping its rear tender truck on the rails when backing northbound between Shailerville bridge and Middletown. Since August 25, 1947 was a Monday, and the local isn't scheduled to go to East Haddam on Mondays, I figured we'd be ok. 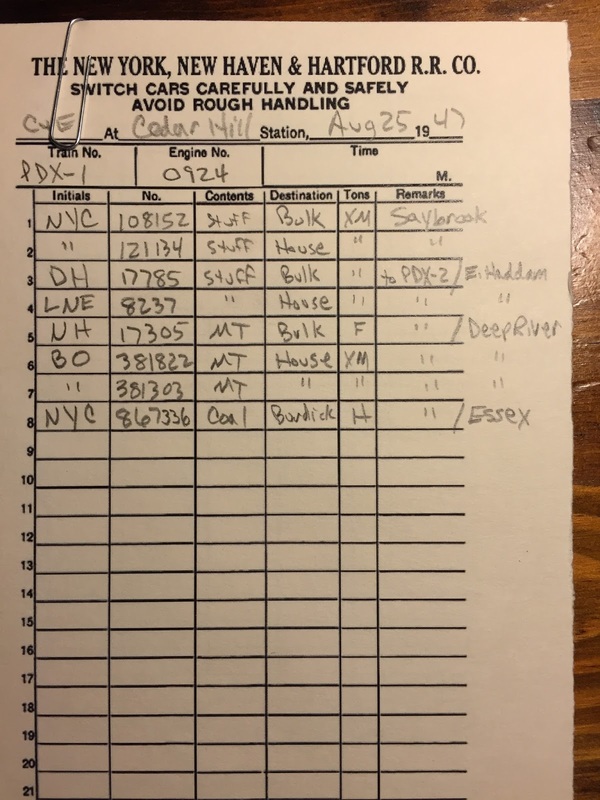 Unfortunately, the dispatcher gave HDX-7 orders to go to Haddam anyway to drop a few cars. Sure enough, when backing up the grade around the curve north of Shailerville - and despite an order to use Restricted Speed - the mogul derailed anyway. No harm done (though its having a Keep Alive keeps us on our toes) - just have to move it into the shop to get that truck fixed by next time. 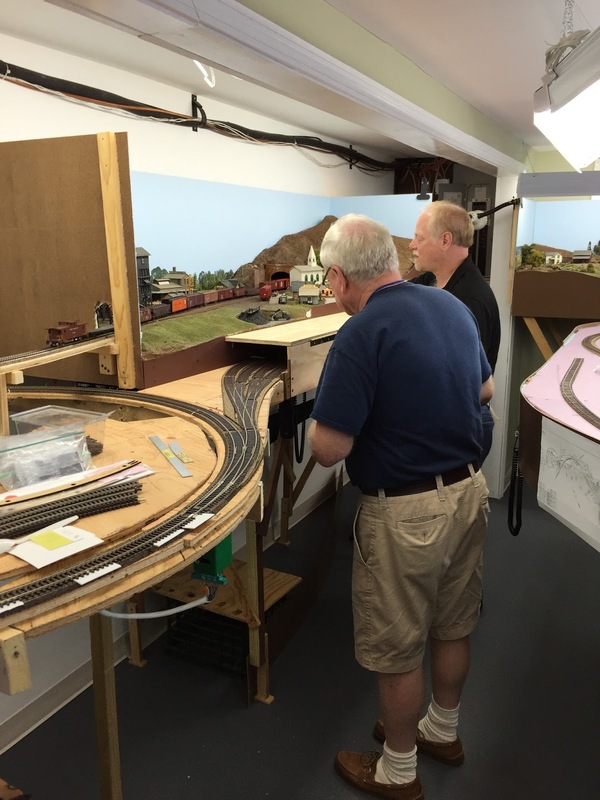 Tom and Joseph working HDX-7, the Valley Local, in Rocky Hill. Pieter and Bob switching PDX-2 in East Haddam. The prototype town probably never saw this many cars at once! Another job for the Job Card. BobV switching Deep River - another town that got a lot more cars than expected. The Airline local (HDX-12) ended up waiting a while in Middletown for the Valley local (HDX-7) to do its work. On the prototype, the HDX-12 would just drop off/pick up cars and go. 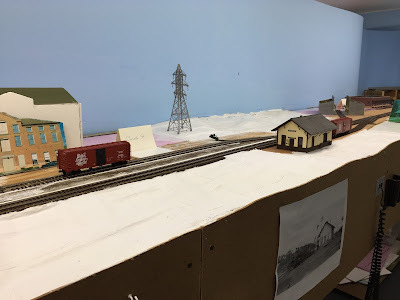 But on my layout, there's nowhere for it to "go" except back to where it came from (unlike the prototype, my Airline ends in Middletown and doesn't cross the CT river). Note: Perhaps I'll be sure HDX-12 has work to do during it's southbound run so it's not done too soon. The Valley local still seems to have an amount of work out of proportion to what it really should have during this era. This session it wasn't a problem though (didn't outlaw). Note: Perhaps reduce the work further. The Shoreline local (PDX-1) is still a VERY short job - it basically comes out of staging into Old Saybrook, does its switching and car exchange with PDX-2, and heads into New London staging. In the future, the crew of PDX-1 will be able to operate "background" mainline trains to fill out the session, but for now, it's a short evening unless they help out with another train. Note: Until then, and especially when I'm short-handed on crew members, perhaps have a crew operate PDX-1 first, then operate HDX-12. The Haddam Local (PDX-2) needs to remember to set out in Old Saybrook any cars that are destined for New London since it's continuing on to Cedar Hill/New Haven, not going back to New London. It should also leave cars along the way that don't need to go further. No sense in hauling cars unnecessarily. Note: Outline this on the Job Card. Create "Job Cards" for each train, and perhaps for every job (Agent/Tower Operator/etc). These are essentially job descriptions that will help the crews know how to do their job in the most efficient way possible. The reality on the prototype is that crews would develop this knowledge over time as they got qualified on the line. 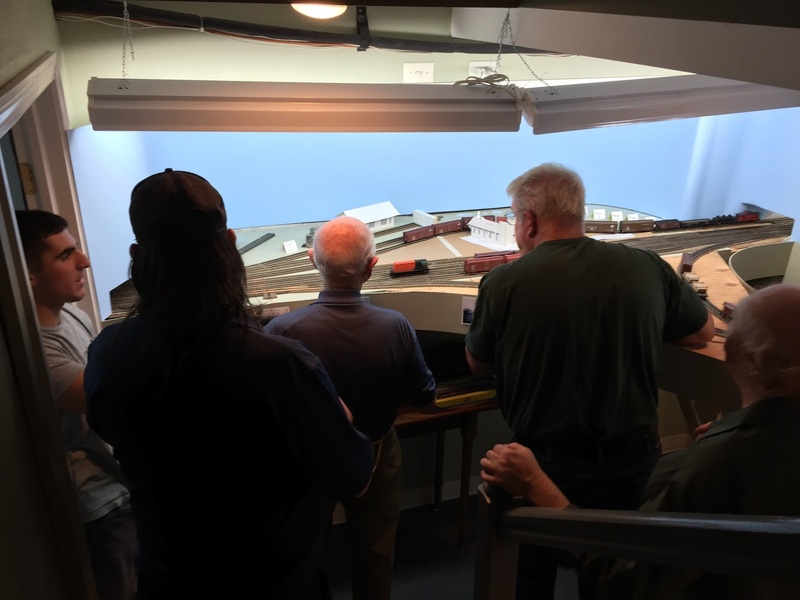 But the reality in a model railroad operating session is that folks may be operating certain trains for the first time and won't have that level of experience and knowledge. A job card could act as the "Senior Crew Member" that gives the newbie operating tips along the way. 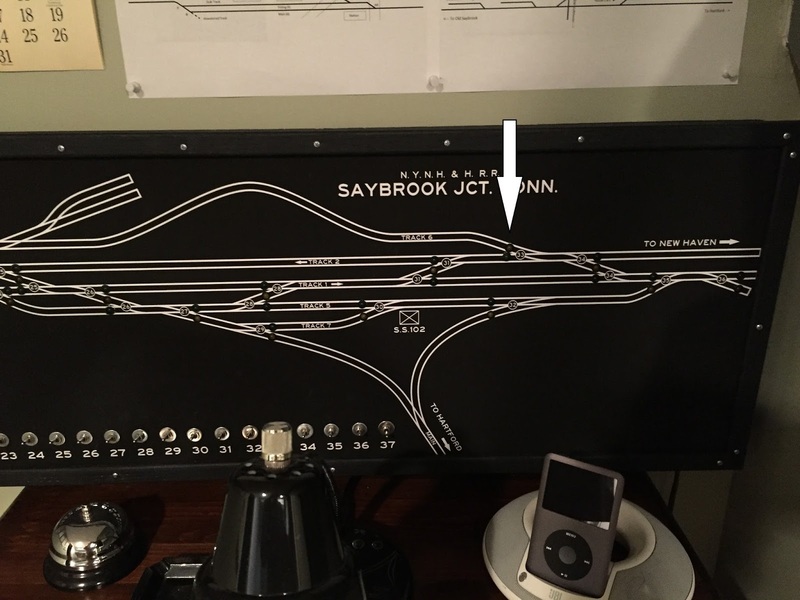 Create Track Diagrams for Old Saybrook/Essex/Deep River/East Haddam. Related to the point above, crews need to know which tracks are which ("where's the House track? where's the Bulk track? for example) and what the siding capacities are. I've had these in place on the rest of the railroad for some time, but not on the latest expansion Saybrook to Haddam. So I need to get them posted by the next session. Install visual indicators of where shorts happen. While the shorting issue seems to have diminished (if not disappeared) in Saybrook, it seems to have REappeared in/around Essex. And we can't figure out why it's happening. It's random and not the result of running through switchpoints. There are no reverse loops - just straight track and turnouts. It doesn't help that when there's a short we only hear it (there's a buzzer attached to each circuit breaker that controls each section of the railroad) but we often don't know exactly where it's occurring (two of the four locals use engines that have Keep Alives which just keep going if there's a short). I'm not sure if the problem is that I need more feeders (i.e. the PSX circuit breaker is occasionally seeing the load of the locomotive as a short?) or something else. Any insights/ideas would be most welcome! Fix #278's tender truck. The next session may again require it to take the Valley Local to East Haddam - and I'd rather not have to worry about its derailing on the curve under Middletown (and, due to its Keep Alive, running right off the track and onto the concrete floor). Alternatively, I could (finally) finish DERS-2b #0510, get it out of the shop and put the 278 in the shop on the bench for a bit. Evaluate the need for another throttle. I have four (4) locals but only three (3) NCE throttles(!). Thankfully, a few of my regular crew members can bring a spare, but it'd be nice to not have to rely on that. I'm considering installing JMRI and Wi-Fi throttles, but haven't figured out how to do that yet. That'd certainly be the most economical. Alternatively, I may decide to get an NCE PowerCab starter set which would: a) give me an additional throttle, and b) be set up at my workbench upstairs for more-convenient decoder programming and troubleshooting. Rolling Stock Maintenance/Repair: a couple of cars had coupler and detail issues that need to be fixed by next session. Continue to massage the spreadsheet that controls car movements - it's still not dialed in as well as I'd like. As I've said before, each operating session tends to highlight new things that need to be done, but hopefully - over time - the to-do list diminishes and the pure enjoyment of operating just continues to grow. And the more often you have ops sessions, the quicker that process occurs. If that isn't enough motivation for regular sessions, I'm not sure what is. 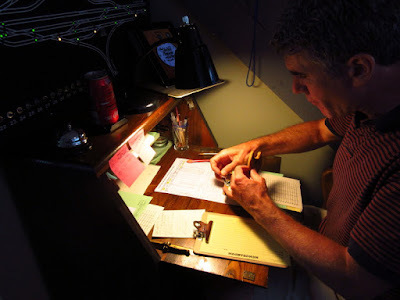 The Tower Operator/Agent in Old Saybrook writing out orders. Having seen the Crew Call for this month's session, I thought you might enjoy a "peek behind the curtain" at the session set-up. Some layout owners may not want to ever show anything but the best of their layouts, but I appreciate any time I can see "under the hood" (literally, in the case of benchwork and wiring) since it gives me a much better idea of how the builder approached the project. And I think seeing some of the nuts and bolts of what's involved in setting up an ops session is interesting too, as well as helpful. Crew Register - first thing the operators see at the bottom of the stairs and for good reason. I really want them to sign it so I have a keepsake of the night. Switchlist for PDX-1 - the Shoreline local from Cedar Hill (New Haven) to New London. For more info on my ops paperwork, click here. PDX-2 aka The Haddam Local, which goes from New London (staging yard above), up the Valley Line at Saybrook up to Haddam, and then back down the branch and on to Cedar Hill. PDX-1 - the Shoreline Local is staged on the "west loop" mainline rather than the staging yard to avoid having first to back out of staging. Right now, it's one of the first trains that moves during a session, but I may have to modify where I stage it once I have mainline trains running. HDX-12 aka The Airline local, staged in "Cedar Hill" - a one track hidden staging "yard." HDX-7 aka The Valley Local - staged in Middletown in order to facilitate reviewing the cars prior to starting. In future - and as I have in the past - I'll have the Valley Local crew start in Wethersfield and run its train "on stage" from "Hartford" (behind the backdrop). Thankfully, the Airline is scenicked - though the towns are fictional. This is Somerset, the first town on the route of the Airline Local. And here are the cars waiting for pickup in Mill Hollow, the other town on the Airline. 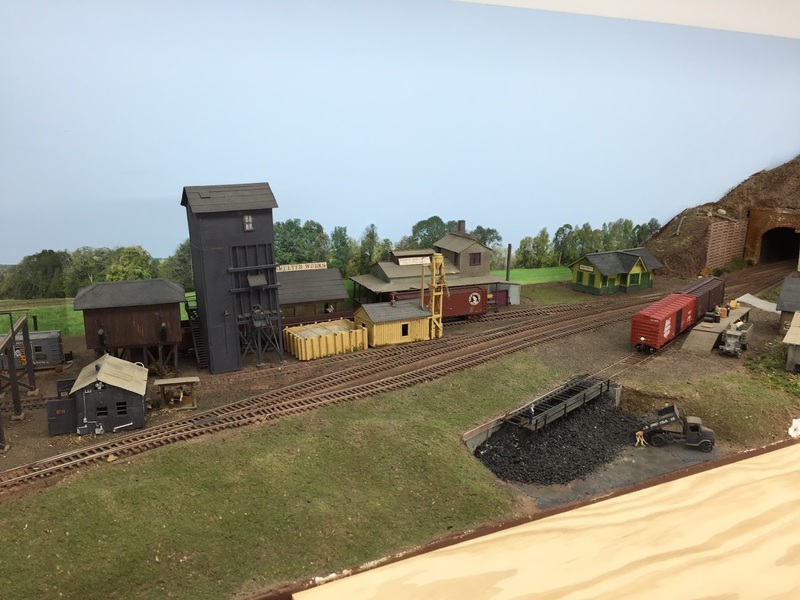 Moving over to Old Saybrook, we see mockups for both the station and the freight house (as well as a footprint for the tower and a jar for the water tank). 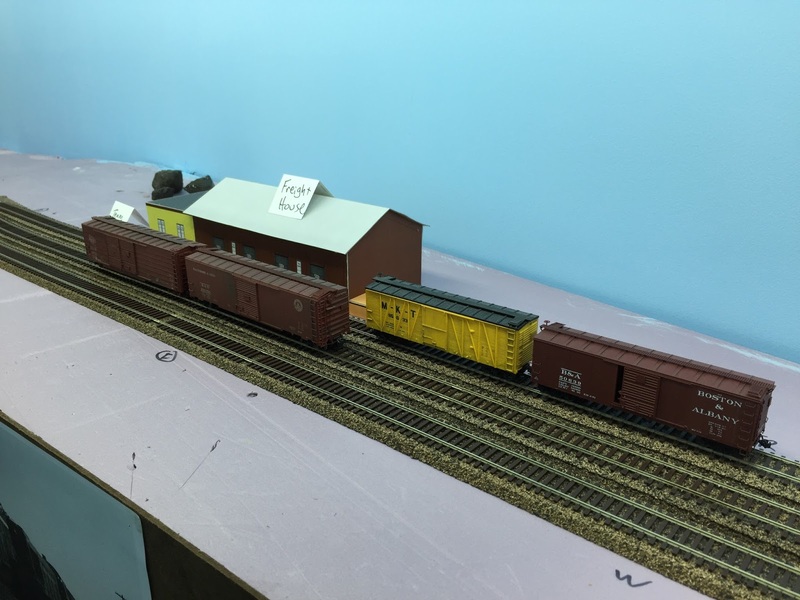 Two cars to be picked up on the house track, one car on the bulk track, and 5 cars on Track 7 to be picked up and taken to New London by PDX-1. 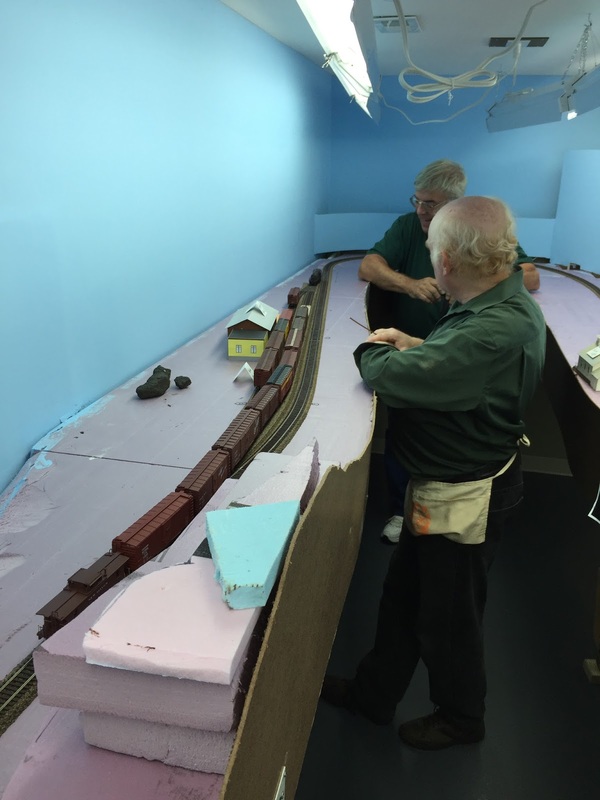 The station platform has been mocked up with cardboard between the recently extended/moved Track 6 (balloon track). Going up the Valley Line branch, first town we encounter is Essex with cars to pick up at Dickinson's, Burdick Coal, 3 cars at the house, and 3 cars on the bulk track. Plenty of room for the local to leave cars here so they don't have to take them north unnecessarily (hint, hint). 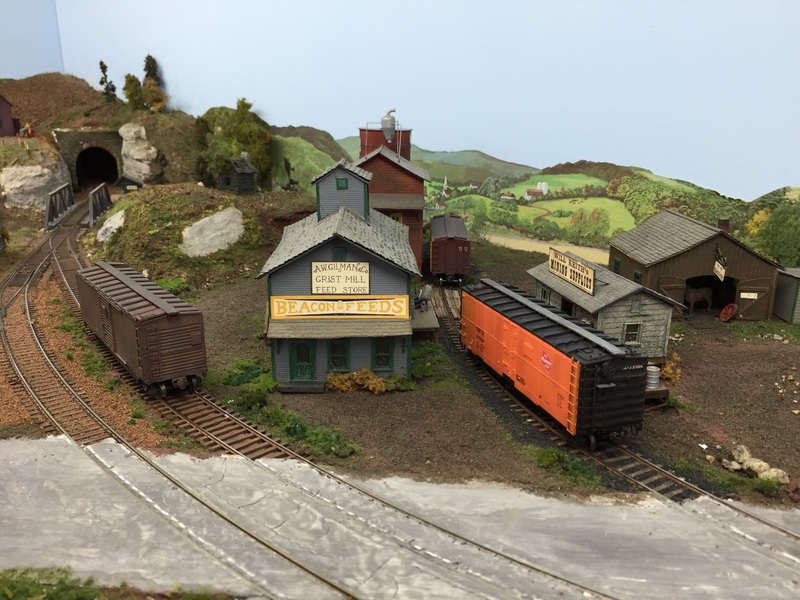 And finally, at the north end of PDX-2's run is East Haddam/Goodspeeds where we have two cars for pickup from the house track and two cars left by the Valley Local on the exchange (center) track that need to be taken back to New London. Continuing north, we come to Cromwell with three empties for pickup from the house track. North of Cromwell is the Dividend section of Rocky Hill where Hartford Rayon is located. It's the largest single industry on the Valley Line and gets tank cars of chemicals (left front) as well as shipping out boxcars of product (back right). The sleepy river town of Rocky Hill is busy with two cars on the bulk track (one still needing to be unloaded, IIRC) and a car at the freighthouse. And finally we reach the north end of the Valley Line - and the first town on the Valley Local's route - at Wethersfield. Here we just have one car on the recently-extended bulk track south of the station. The Local will be delivering cars to Wethersfield Lumber (back right) and Ballentine's beer distributors (extreme back right) during the session. 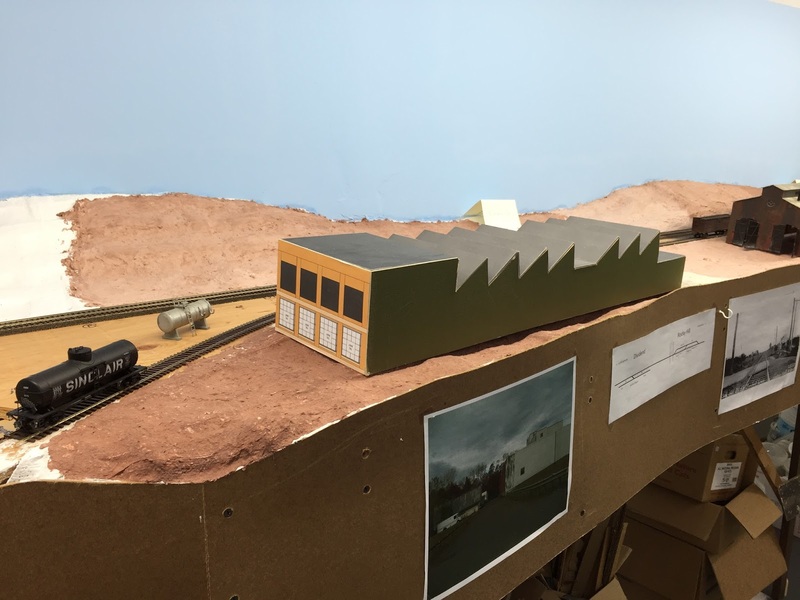 So there you have it - a quick snapshot of the layout prior to its last shake-down operating session. If all goes well, I should be done with trackwork modification (finally!) and can start getting some more scenery into these scenes. 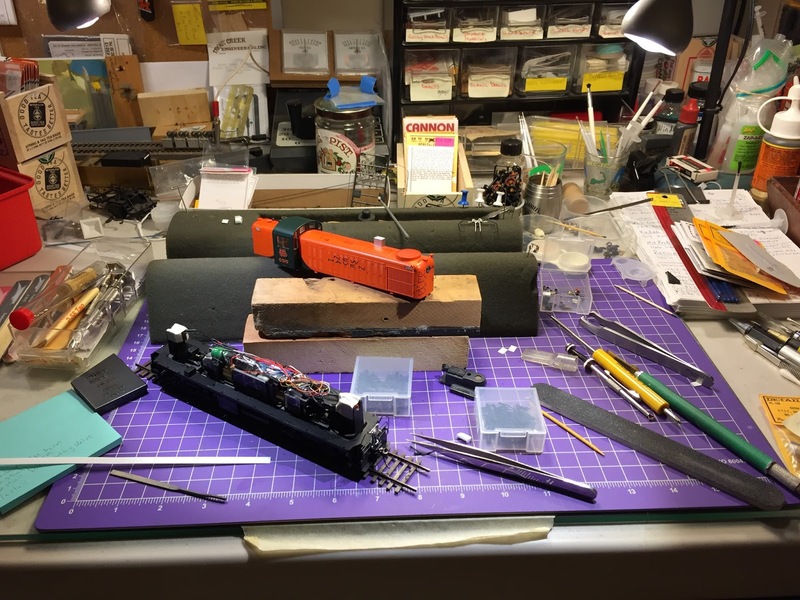 A big - if not the biggest - reason to be a prototype modeler, IMO, is to create the closest thing you can to a time machine. 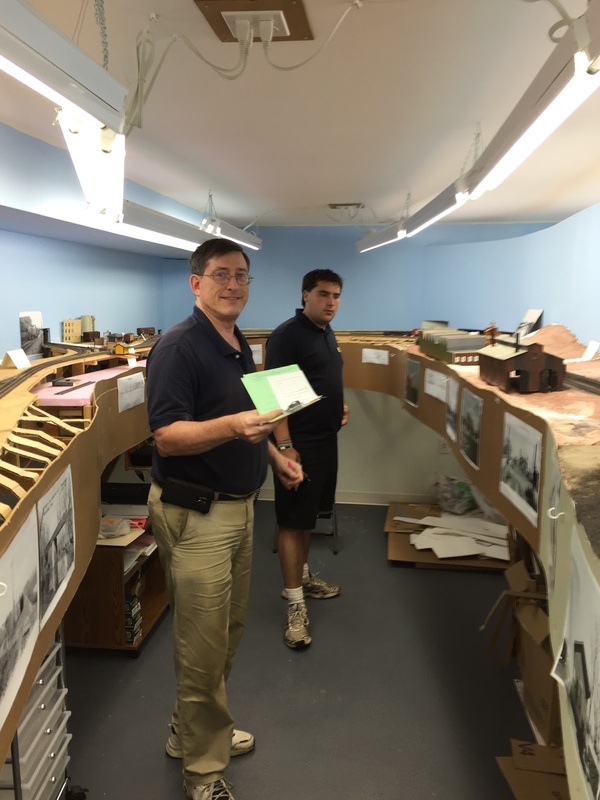 All the historical research, all the modeling skills, and all the other work involved in building a prototype layout all goes toward creating a miniature version of a particular slice of space and time and to convey, as much as possible, what it was like to live & work on the railroad during that time, and in that place. One of the sometimes-overlooked components of conveying that sense for your operating crews is the Crew Call. I first introduced my approach a couple years ago, developed primarily from an idea I saw on another friend's layout. And since I have an operating session coming up, I thought it'd be fun to share the call for that session. August 25, 1947 is a Monday and Harry Truman is the president. The local forecast is for fog in the morning with temperatures starting around 70 degrees. But it'll be hot - especially for steam locomotive crews - since the high will be in the low 90s. Phil Harris' "Smoke Smoke Smoke (that cigarette)" is the #1 song in the country, but steam locomotive firemen should be mindful of producing too much smoke, especially in Middletown. The average cost of a new house is $6,600, gas is only 15c per gallon, and it'll cost you about $1,300 for a new car. But keep in mind that you're probably making less than $3,000 per year - and that's on a railroader's pay. The Boston Braves hit 1 million in attendance for the first time last week. The movie "Miracle on 34th Street" premiered just a couple of months ago. On this day two years ago - and only 10 days after the end of WWII, the Chinese Communists killed U.S. intelligence officer John Birch, who became the first victim of the Cold War. Tensions with the USSR and fear of communism are rising. Later on this day, Marion Carl, US Navy test pilot, will set a world speed record of 651 mph in a D-558-I at Muroc Field (later Edwards AFB), Ca. PDX-1 (The Shoreline Local) will have DEY-1b (HH660) #0924 for power and will depart Cedar Hill for Old Saybrook with 8 cars for local industries and to pass to PDX-2 (The Haddam Local) for up-river consignees. PDX-2 (The Haddam Local) will have DEY-5 (S-2) #0615 for power and will depart New London for Old Saybrook with 9 cars for the towns of Essex and Deep River. It will also accept cars from PDX-1 in Old Saybrook. HDX-7 (The Valley Local) will have K-1 (2-6-0) #278 for power and will depart Hartford for Middletown with 12 cars for down-river consignees. Since it's Monday, this train may leave cars destined for East Haddam in Middletown for movement the next day. HDX-12 (The Air Line Local) will have DERS-1b (RS-1) #0669 for power and will depart Cedar Hill for Middletown with 8 cars for local industries and interchange with HDX-7. Of course, the crews of each of these trains will report to the agent of each town on their route for any additional car movements which may be required. Also, be sure to review the latest Bulletin Order and sign the Employee Register when you arrive, or else you may forfeit your pay for the day. I think little bits of historical information like this really add to the flavor of the operating experience and make the whole evening a bit richer. If I'm doing my hosting job right, my operators should feel like they've stepped back in time and are really working on the New Haven Railroad in the lower Connecticut River Valley in 1947. If you have any additional tips or suggestions that you've found enhance operations even further - or create a better time machine - I hope you'll let us know. Now, I just have to make sure the layout is all ready for the show . . .
Work on the DERS-2b continues - got steam heat & signal hoses as well as speed recorder details while on vacation. I really need a hobby. Oh . . . right. Ah - Summertime! and while the livin' may be easy, it isn't the most popular time for model railroading for good reason: you'd often rather be outside than in your basement. But Summer 2016 has been an especially hot one, and being indoors in the A/C has been nice. Especially when you're able to do some modeling. And that's what I've been doing for the most part. If you've been a regular follower of my progress, you know I've been doing more modeling than working on the layout lately. Click here for the posts - I finished the GTW boxcar (finally) and am within striking distance of completing the detailing on my DERS-2b (RS-2). Other than modeling, the other big story of the season - for me at least - has been the return of regular operating sessions to the Valley Line. 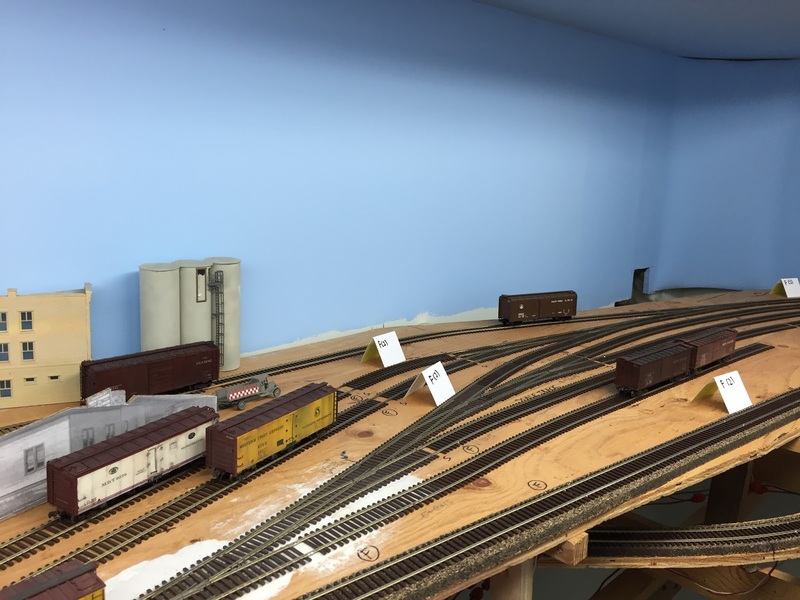 And those sessions have produced my "to-do"/punch list for any additional physical progress which needs to be done on the layout itself. 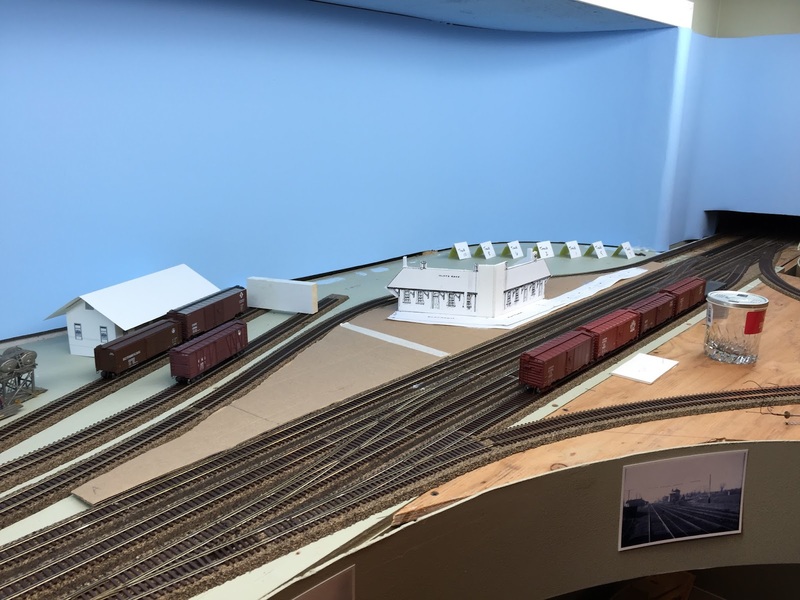 As a direct result of operator input, not only have I extended track in Saybrook and totally reworked the entrance to the west end staging yard, but I've also modified the track in Wethersfield for what must be the 100th at least the third time. More on that in a future post, but suffice it to say things have been percolating right along this summer, despite the season's distractions. The Valley Local (which happened to be the train I was running) outlawed again - this time only getting as far as Middletown before we had to stop the session. It took a LONG time to set up the session (about as long as the session itself!). Extend Track 6 in Old Saybrook to allow PDX-1 to do its switching without fouling the main. 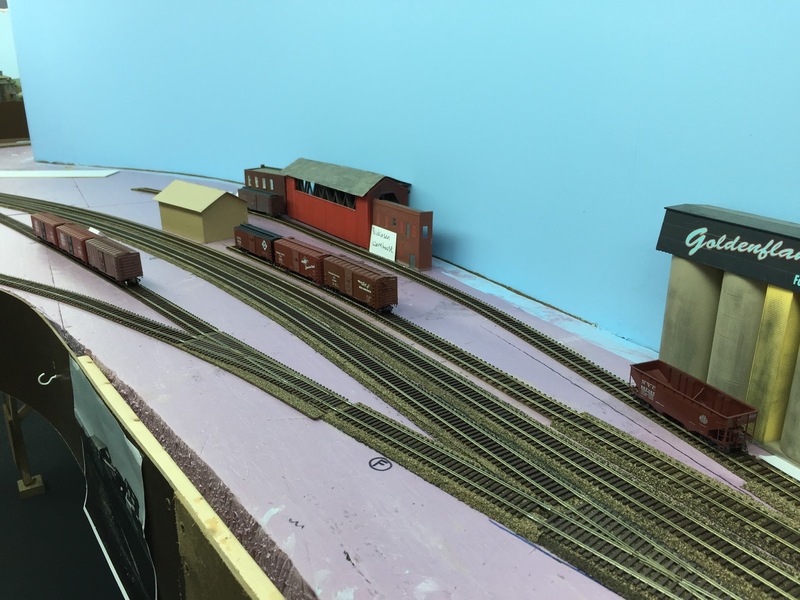 Extend the Bulk Track in Wethersfield to provide some additional breathing room for spotting, working, and storing cars. We didn't operate in July and the August session is later this week. Fortunately, as I mentioned above, the major "to-do" items are done now so we can see how those improvements work out later this week. The other major thing I'm working on - and which is taking, and will continue to take, a surprising amount of time - is trying to balance the work that the locals do, while remaining as true to prototype operations as possible. This will address the major, persistent problem I'm having with the Valley Local which always seems to have much more work than all the other trains. So I'll be running One More Session this week, using the same setup I've been using, to see if the problem persists. And maybe, since it'll be "Monday, August 25th, 1947", I won't have the local go to East Haddam. That's only served on Tuesdays, Thursdays, and Saturdays, at least according to the prototype info I have. Other than that, I may need to tweak my spreadsheet a bit, to balance things further. But these last lazy days of summer are the perfect time for such tweaking. The Main Modeling Seasons of autumn and winter are coming up and I hope to have the operations nailed down by then. I discovered this stove in the Chatham station. It's the same type as my stove - a Stamford Foundry Ledger B - but it's MUCH larger, hence a different model number (No. 14). Here's my stove for comparison - a Ledger B No. 9. 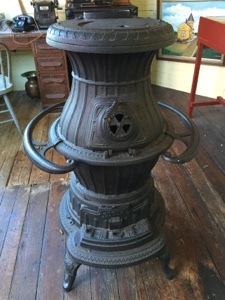 Clearly, the same stove was made in different sizes for different applications. The No. 14 was intended to heat an entire station whereas the No. 9 was sufficient for the crossing shanty it was put in. For more of that story, click here. It sure would be cool to find and reinstall the neat guardrailings. Let me know if you ever run across such a thing. 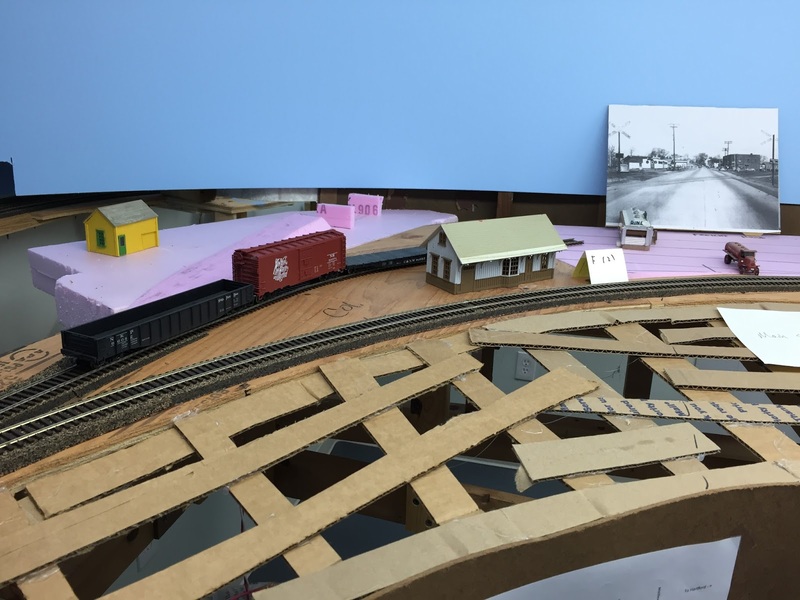 One of the cool contrasts I'm trying to replicate on my layout is the difference between the 71-train-a-day mainline in Old Saybrook versus the meandering 1-wayfreight-a-day branchlines. 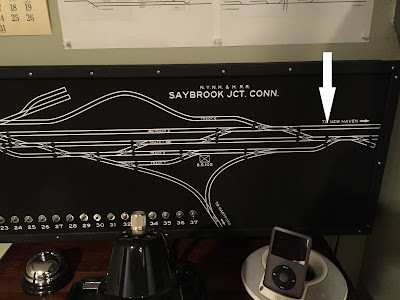 As I've mentioned before, all the mainline turnouts in Saybrook are remotely operated by the tower (I even built a control board based on what was contained in SS 214), but out on the branches, they're all manually controlled in keeping with the prototype. Consequently, all but one of my turnouts are from Micro-Engineering which have a center-over spring that locks the points in place - you push the points over and they'll "click" to the other side. No fuss, no muss, no machine, no wiring. Of course, for the turnouts on the mainline in Saybrook, you have to remove that little spring so that the points can be moved by a machine, but on the rest of the railroad you just push the points over. Here are the three other ways I manually control my turnouts. Once you remove the little center-over spring - and glue the turnout in place - your options for going back to manual control are, um, somewhat limited. One way would have been to go to the trouble of removing the turnout and reinstalling the spring. But the above solution was MUCH easier, though less elegant. I just used a Caboose Industries ground throw, modified with a little bent wire to pull/push the points back and forth. The ground throw isn't exactly scale, but that's ok since it's right next to the liftout (this area isn't going to be a focus). And it's effective and just about bullet-proof. This location is just south of the grade crossing in Rocky Hill and partially scenicked already, so I didn't want to use an oversized ground throw here. The center-over spring had failed (or otherwise disappeared somehow) and was leaving the points flopping about. So I improvised, taking a spare spring and installing it directly on the ends of the ties. It works "fine" - not as snappy as it came from the factory, but it still works and saved me having to rip up scenery to replace an otherwise fine turnout. Finally, I tried a more mainstream solution - and ironically in a location where it wouldn't have been a huge deal to remove/replace the turnout. But there was no need - the turnout (and center-over spring) operate just fine - it was just difficult to reach. So I used a tried-and-true remote operating solution. First, I drilled a hole through the plywood between the ties and press-fit some copper tube. I then inserted wire and bent it (as you see above) to go into a hole drilled into the end of the throwbar. Underneath, I bent the wire again, as above, to allow me to put a coat hanger actuating rod on it (and bent the wire up at the end to keep the rod from coming off. The coat hanger goes out to the edge of the layout and through the fascia, supported by staples, as you can see above. The result is a pretty simple and straightforward way to "push the points" remotely and it works like a charm. The only other thing I did was glue a wine cork to the end of the coat hanger to keep it from snagging on anybody's clothing. This also has the effect of causing folks to use their fingers to gently pull/push the wire rather than be too ham-fisted. I really like the ME turnouts' ability to install and operate with no other machine or actuator required - just push the points. But if for some reason you removed that capability and want to restore it later - and you don't want to remove or replace the turnout - I think you'll find one of the solutions above worth trying. One of the down up sides of operating sessions is that problems which had only been latent - and therefore easy to ignore (if noticed at all) - become All Too Apparent. At least to your operators. I've touched on this before. unFortunately, I have another recent example . . .
Our operating sessions are based on our best guess as to how trains operated here (at least until somebody can please supply more accurate information) and a typical session has PDX-1 (the New Haven/New London local) coming into town from the west (which is from the right on my layout) and getting off the eastbound main (track 2) by going into track 6. 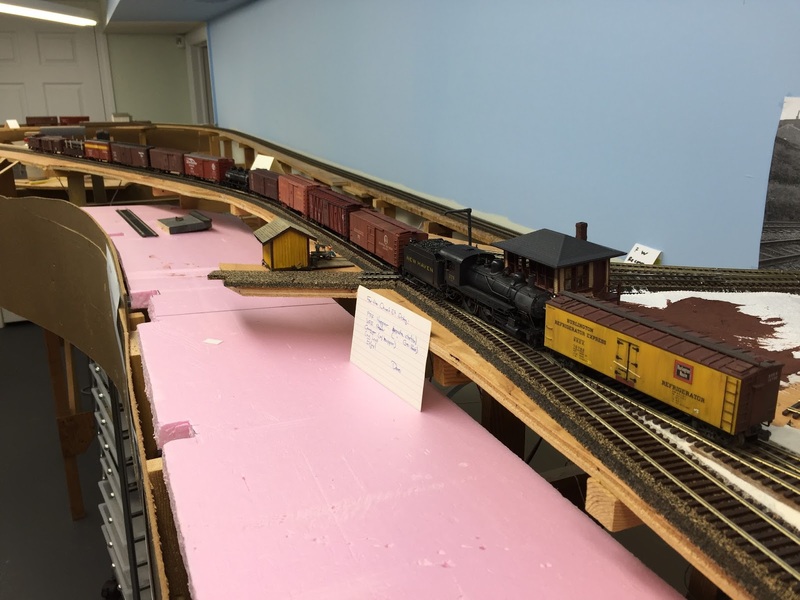 The local uses track 6 to store its train and to work the bulk track (track 8) and the house track (track 10), all while staying off the mainline. Eastbound trains come from the right/west end staging (accessed through switch #36) go past switch #35 and through crossover #34 to get to eastbound track 2. If it's a local that needs to go into the balloon track (track 6), it takes the diverging route through switch #33. 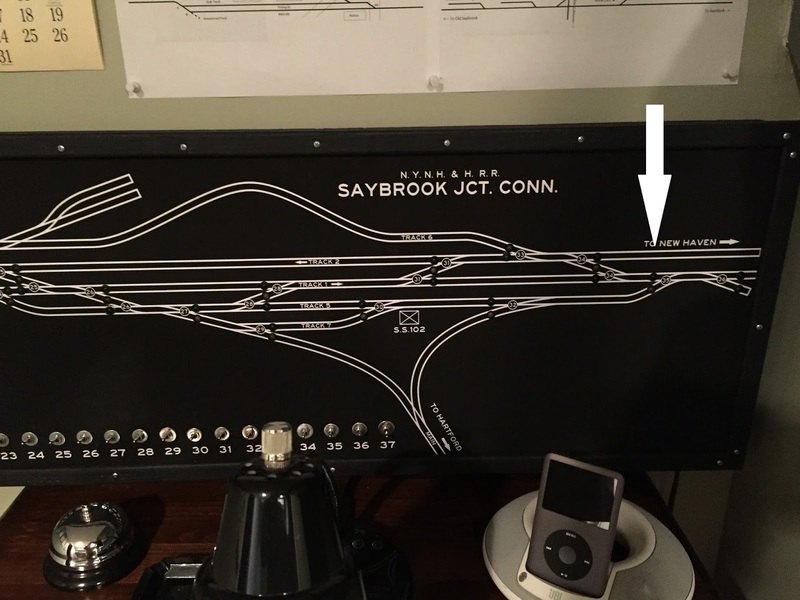 Those two parallel tracks that go off to the right ("To New Haven") actually connect, making a reverse loop. It's that reverse loop - specifically the "top" side - that PDX-1 has been using as a switch lead into track 6. As you can see following the trackplan above, this avoids fouling the mainline operationally. However, after a recent ops session (and after realizing that to even come close to simulating the heavy mainline traffic in Old Saybrook) it became very apparent that we'd need to use the reverse loop for (fairly) continuous running of trains (there's no way I can make the staging yards large enough to make this unnecessary). So PDX-1 would no longer be able to use the reverse loop as its lead. It'd have to be totally off any main track while doing its switching. To address this, "all I'd have to do" is move one turnout and extend track 6 . . .
From here . 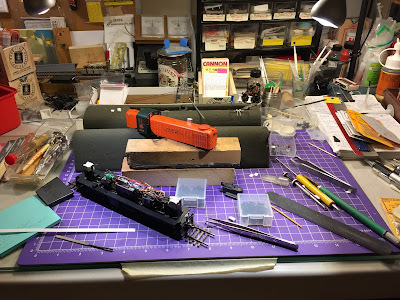 . .
Now, mind you, this only became apparent after the track is all corked and glued down, and after the control panel has been done not once, but twice already. Well, after much consideration - and reconsideration - and consulting with trusted advisers - and a couple glasses of wine, I decided NOT to modify the control panel (not yet anyway), but would at least move the turnout and extend the track. 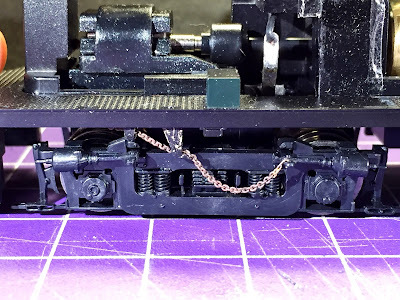 Operationally, the actual physical location of that track 2/track 6 switch/turnout (switch #33) shouldn't make much of a difference on the panel. I guess we'll see. But at least track 6 is extended now . . . The turnout to track 6 had been just to the right of the crossover. Here you see I've already started extending the cork roadbed. And here - though it's tough to see (it was even tougher to work in here!) - you can see the new turnout position. Since I had to rip up part of the reverse loop anyway, I decided in for a penny, in for a pound and ripped up the whole thing. Long time readers will recall that this reverse loop (aka the West End Loop) has given me fits for a while - from kinks that had to be fixed (resulting in multiple sections of flextrak - and additional rail joints), to a made-to-be-curved turnout that hasn't ever operated quite as well as I'd hoped. Thanks to an actual-honest-to-goodness curved turnout from PeteL, and yet-more-flextrack from Tom's Trains, I relaid the West End Loop - and the approach to the staging yard - as I should have done in the first place. But, of course, this didn't happen without a little bit of head scratching first. (re)Laying the curve between the turnouts (the new turnout to track 6 and the new curved one going to staging) was pretty straightforward - just be sure to solder the joints with the track straight before curving the track so you get a nice, gentle, kinkless curve. That is very important. Bonus: since I was installing just two new sections of flextrack, I was able to reduce said joints from 3 (6 soldering points) to just 2. It's a MUCH smoother curve now. However, replacing my "franken-turnout" with an actual curved turnout was much less straightforward since it was impossible to put it in a position that didn't significantly change the geometry of the approach to the staging yard. "All you have to do is . . ." I swear, I'm going to ban this phrase from my basement - especially when uttered in relation to the layout. %^) Sure, all I have to do is "drop in" the new curved turnout, which requires me to move the staging yard turnouts, which requires me to move all of the staging yard tracks, all while trying to avoid the front wall of the staging yard box - and having to remove said wall and widen the staging yard benchwork. Adding more cork roadbed under it all isn't even worth mentioning. But all the work that ended up being necessary was worth it in the end. I was able to just fit the yard throat past the box wall (after beveling the vertical edge with my saber saw and a rasp for some added clearance), and my yard throat track radii didn't change as much as I'd feared. Other than the time/work involved, the only other downside is that the change pushed all my fouling points back a few inches - but not enough to diminish staging track capacity significantly. Whew! The new curved turnout works MUCH better and more reliably than the previous made-up turnout. 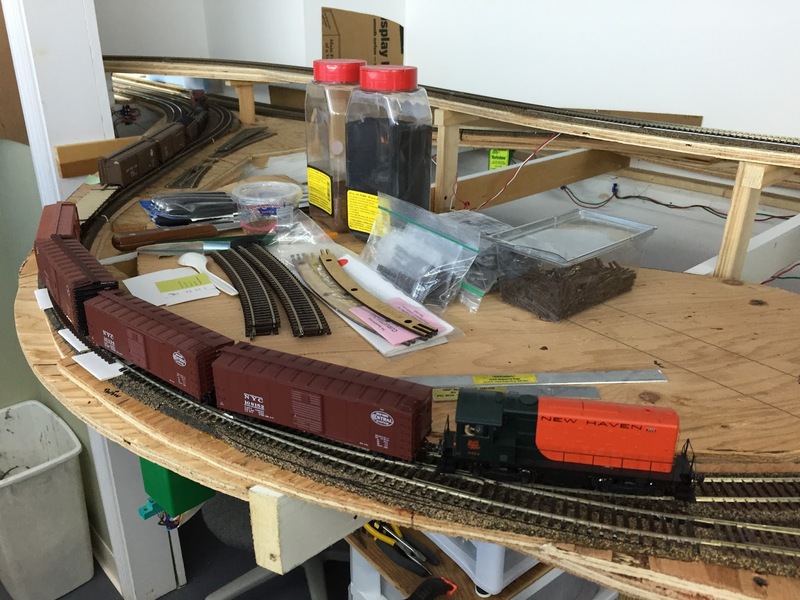 Lesson learned: while Micro-Engineering turnouts are slightly curveable to make your trackwork flow better, don't try to make one into an actual curved turnout. Get what you really need for the situation. 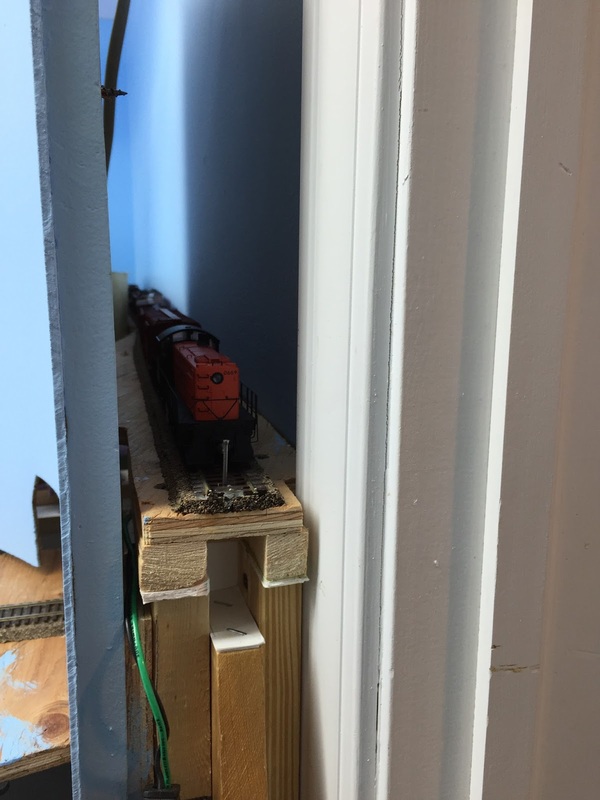 As you can see above, I'm still fussing with the curve a bit by shimming the outside rail. 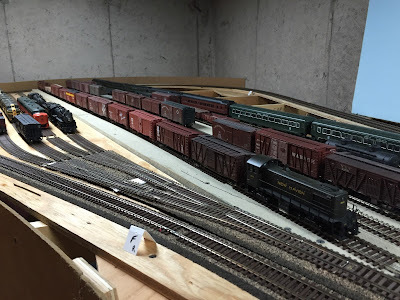 While running passenger trains back and forth over the new trackwork, I discovered that the trailing truck on my I-5 Hudson would tend to climb up the outside rail when running backwards. Fortunately, the only time the I-5 will be running backwards is when backing back into staging, but since I plan to (re)cover this curve with fascia (and, eventually, scenery), I'd like to get the trackwork as bulletproof as possible. So, another major modification done. 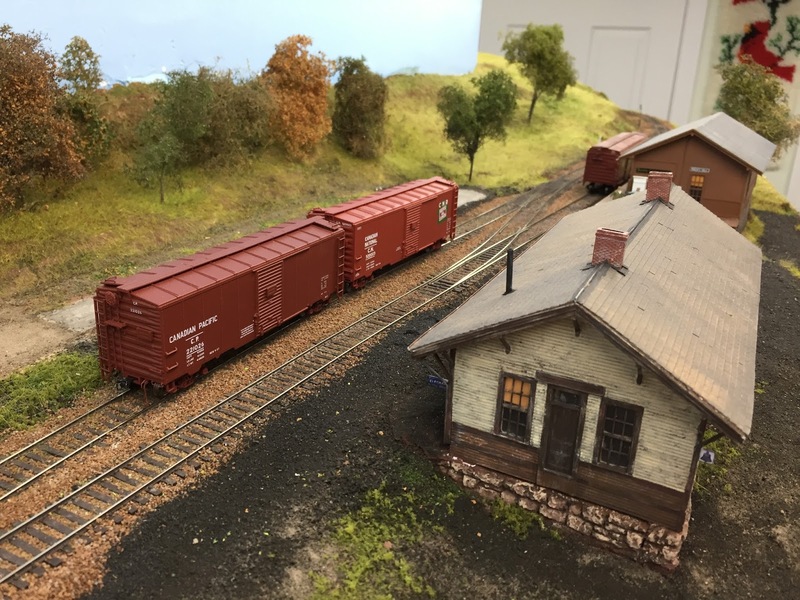 I can't recommend highly enough that you operate your railroad as soon as possible - well before scenery. As I've discovered, it's often only then that you realize that you need to make some trackwork changes. You're in good company though - the prototype had to change its track arrangements from time to time too!